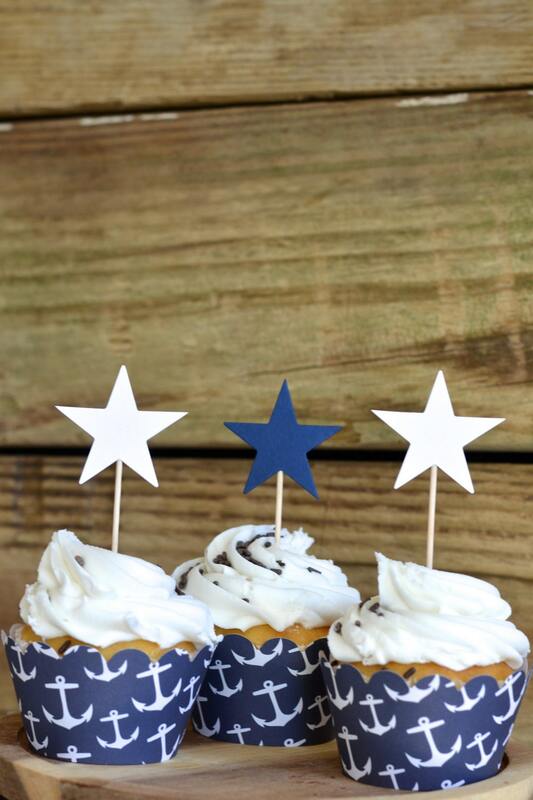 Navy Anchor Cupcake Wrappers - Sets of 12, 25, 30, 40, 50, 75, or 100. Perfect for nautical or travel themed birthday, wedding & more! 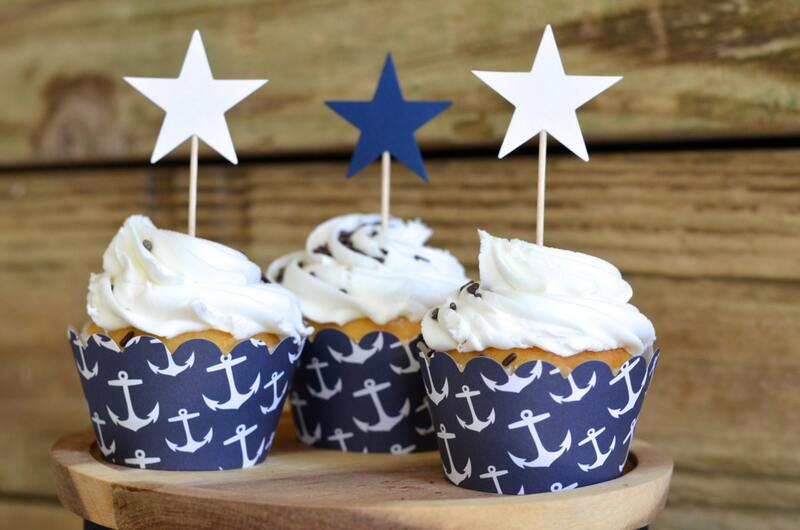 Set sail with these wonderful anchor print cupcake wrappers! 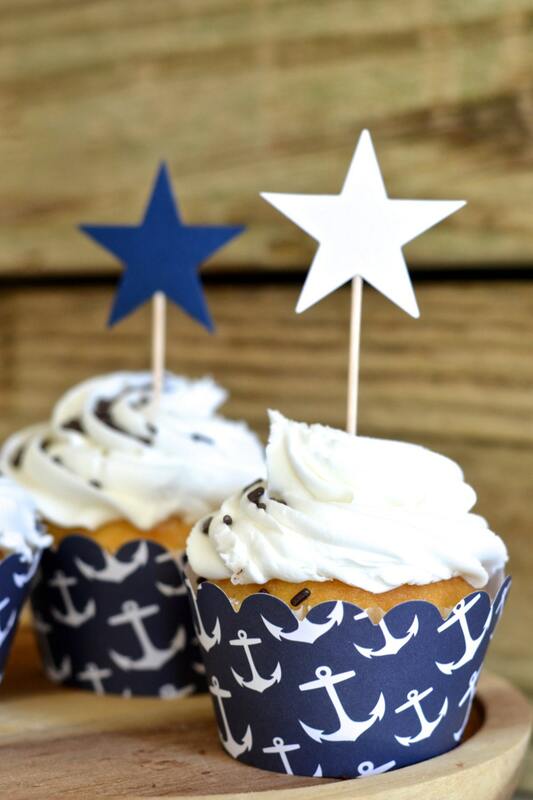 Each wrapper features an array of white anchors on a deep navy background that will having your guests sailing the seven seas and calling you "Captain". Arrrrgh! These scallop topped wrappers fit a standard size cupcake perfectly. When standing, they measure 1.5" (4 cm) tall, 2.75" (7 cm) across at the top and 2" (5 cm) across on the base, and each set comes with your choice of 12, 25, 30, 40, 50, 75, or 100 wrappers. Would you like more? Just let us know! Please note that these wrappers are constructed using basic print paper and are suitable for most occasions. They are not heavy card stock. To keep shipping costs as reasonable as possible for our customers, we ship these flat (unassembled). Each one will take about 5 seconds or less to assemble and we include easy "How To" instructions in each package. This product is hand crafted in our pet free, smoke free, peanut free studio. We love our purchase and also the extras included are great, VERY kind owner who showed such honor for dads "US Navy" Themed suprise 80th bday party ! Fast shipping :) HIGHLY recommend this seller!!! Simple adorable! Thank you for the quick deliver!